LARCHMONT, N.Y. — Ranging from a fine piece of carved antique jade and two concert pianos to paintings and silver serving pieces, Clarke Auction Gallery’s sale on April 7 was especially diverse. 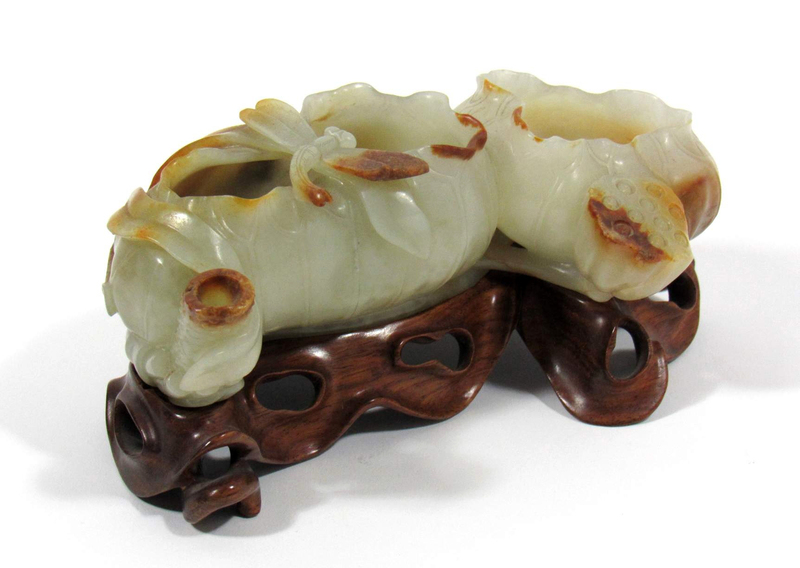 Asian art routinely performs well at auctions, and so it was not surprising that a finely carved celadon and russet jade double brush washer, Eighteenth/Nineteenth Century, with two lotus leaves curling around a dragonfly flanked by blossoms and a seed pod, rose to the top with a selling price of $33,000 and going to an online bidder. The piece, which rests atop a carved rosewood stand, measures 1¾ by 5¾ by 3¾ inches. The selection of furniture ran the gamut, led by a highly carved R.J. Horner mahogany dining set that finished at $22,500 to the phone. Watch for a full report on this sale to follow.